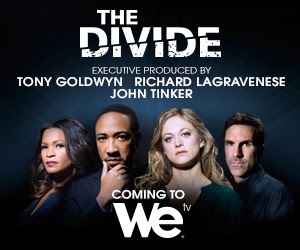 Just a word about a TV series that I'm guessing too few people are aware of: The Divide, on basic cable channel WE tv. It's a smart updated noir set in the Philadelphia of today but hearkening back to the classic noir Philly writer, David Goodis. The Divide begins with an Innocence-Project-like group that specializes in revisiting the DNA evidence in prior convictions, in this case investigating the conviction of a white man awaiting the death penalty for murdering 3 of the 4 members of a middle-class black family. The cast includes the surviving daughter of that family, the black district attorney and his family, a young man convicted of complicity in the murders, now serving a life sentence, and members of the legal group, with a particular focus on a law student whose own father is imprisoned for a crime he may not have committed.